Spillman Farmer designed BASD’s new elementary school on a challenging site: a mountainside in a well-established urban neighborhood, along a busy street. The resulting design supports the school’s and District’s programming needs, creates a safe environment for children that fits into its surrounding neighborhood, and strategically navigates the site’s unique topographical features. The mountainside site for Bethlehem School District’s Donegan Elementary School posed a considerable design challenge to Spillman Farmer Architects’ team. The steeply sloped site is located in a well-established urban neighborhood, along a busy street. Most students live nearby and walk to the school from the surrounding neighborhoods. The Districts’ goal was to build a school that not only supported its programming mandates, but also provided safe, pedestrian-friendly accessibility for all students. To meet these goals, Spillman Farmer Architects designed a structure composed of a three-story classroom wing at the lowest elevation and a single-story administrative wing at the highest, connected by a distinctive two-story glass bridge. This bridge is not only an exciting design element, but also a creative strategy that allows students easy access from the lower level to the upper level main entrance. Attractively landscaped courtyards and colorful wall murals guide pedestrians to this primary entrance. 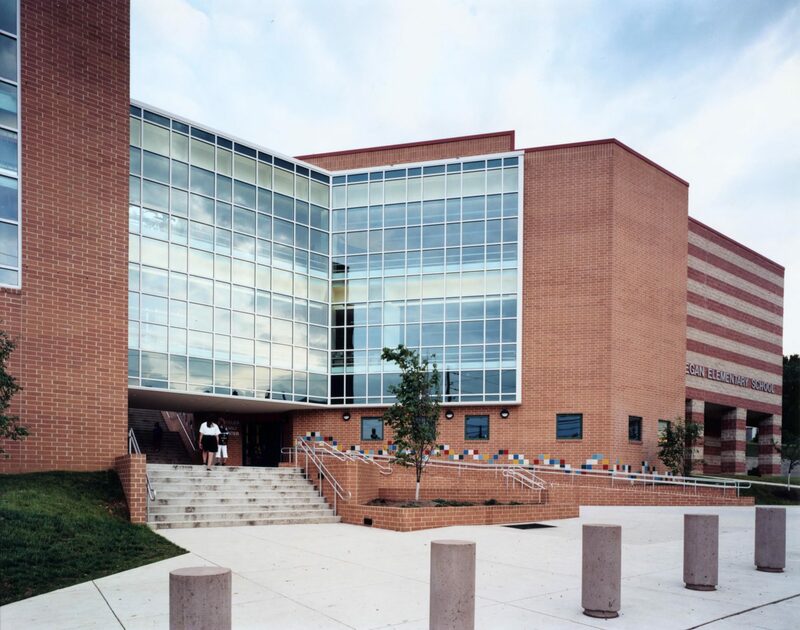 The school’s exterior harmoniously combines red brick, split-faced block, and green-tinted glass. The glass bridge, visible from the outside, provides visual interest. Inside, the glass of the bridge is extended to provide floor-to-ceiling glass walls in both the library and art room. Other interior design elements include exposed steel in the school’s gymnasium, bridge, library, and art room, which recalls the City’s historical significance as an American center for steel production.